The Restoration and Preservation of Jewish Cemeteries – some welcome news. The Future of our Cemeteries – the debate continues. 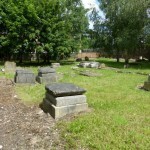 Quakers Lane Jews Burial Ground in need of help! Deane Road Cemetery – Heritage lottery Fund Success!